When a government agency in Phoenix was recently given a budget to remodel its downtown facility and upgrade its AV equipment, it called on Troxell—a local full-service education technology company—to design and install a key component: a new wireless microphone system. The remodeled facility now offers seven fully integrated, multimedia meeting rooms featuring 125 channels of HD audio delivered via 16 Executive HD systems. 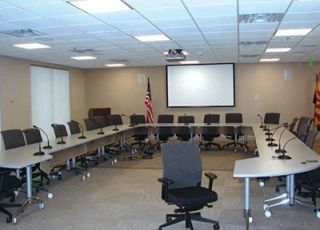 The wireless system was essential because one of the primary functions of the facility is to provide city associations with multiple meeting rooms for use in audio and video conferencing. Before the upgrade, the conference facilities consisted of one large assembly room with 32 wired gooseneck microphones, in addition to a few smaller meeting rooms. Unfortunately, the wired microphones meant unsightly cords running on the floor that people could trip over, while limiting the configuration options for changing room layouts to accommodate various applications. To literally cut the cords on the agency’s gooseneck microphones for a clean look that would also provide the flexibility the agency had been missing, Troxell turned to Revolabs’ Executive HD wireless microphone system. A single Executive HD system provides support for up to eight microphones. Multiple units can be linked together to support up to 32 microphones, each with an independent channel to operate together in one area without interference. The Executive HD can be integrated with all control systems via RS -232 or ethernet. A front-panel LCD display provides control and configuration on-location, while management software enables remotel monitoring and control. The security of 128- bit encryption provides the assurance that meetings remain private. The remodeled facility now offers seven fully integrated, multimedia meeting rooms featuring 125 channels of HD audio delivered via 16 Executive HD systems. The wireless microphone systems are integrated into the PA system, providing voice amplification for public announcements in addition to audio for conferencing. The wireless gooseneck microphones were created by Troxell using Audio-Technica bases, astatic dynamic goosenecks, and Revolabs’ XLR wireless microphone adaptors. Each rechargeable XLR adaptor provides up to eight hours of talk time, saving the significant expense of battery replacement.